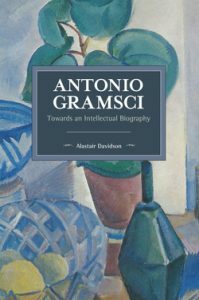 Alasdair Davidson’s Antonio Gramsci was originally published in 1976 and while this new edition does not contain any updated material, it comes with a new introduction in which the author claims the book to be the latest major English-language biography of Gramsci. Despite the title, it is not only an intellectual, but also a psychological, sociological and political biography. In his new introduction Davidson says that, as a committed university student in Australia in the 1960s, he came to revolutionary theory via Stalin and Lenin. Marx was only secondary. Trotsky was excluded. Belonging to the weak and the defeated, the past was said to be worthless! Only Gramsci had remained the intellectual Marxist hero, neither blamed for not being a Stalinist (unlike from Rosa Luxemburg) nor for being a Stalinist (unlike from Lukács). Thanks to Gramsci, Davidson’s Marxism opened up and developed. The 1976 foreword by Norberto Bobbio praises Davidson’s sobriety, as he does not waste time discussing whether Gramsci was heretic or orthodox, or if he was more interested in Lenin than Trotsky. Also, Bobbio appreciates Davidson’s admiration for Gramsci’s moral strength and intellectual honesty. It is worth mentioning that at the time, even the stubbornly liberal Bobbio was excessively influenced by the neo-Marxist tide and missed the important point that the unity between thought and action did not come to Gramsci from Marx (who did not maintain it in any original way), but from Giuseppe Mazzini (whereby Bobbio claims that ‘if the ideal life of a militant Marxist is a unity of theory and practice’, then Gramsci is an insuperable example (xxv). The lengthy first chapter, ‘A Country Boy’, mainly focuses on the social history of Sardinia from the middle ages onward. It is a sample of typical Marxist social history. I use the word ‘typical’ thinking, for example, of Arnold Hauser’s The Social History of Art , where a remarkable amount of information about demography, economy, taxation, climate, agriculture, etc. is for the most part disconnected, gratuitous and does not assist in understanding artworks. Here, similarly, the relationships between the data provided and the development of Gramsci as a person are weak. Not always, however: it is interesting to learn that Gramsci did not idealise ‘the people’, differently from the vast majority of Marxists and fascists. Since he was a boy he thought that the ‘poor or the mass’ had no nobility; he feared, hated and eventually despised them and, ‘more privately he detested their cruelty and insensitivity’ (54). In the second chapter, ‘Making the Country Boy an Italian’, we see Gramsci going to Turin and both studying literature at university and joining the socialist milieu. We read an effective description of the young intellectuals in those two decades before fascism took power: while reading La Voce, they were sick of democracy, socialism, peace, technology, science and positivism. Who or what saved young intellectuals like Gramsci and Piero Gobetti from becoming the forerunners of fascism? Davidson’s answer is Benedetto Croce. The youth who understood and enjoyed Croce did not become fascists. Others were fascinated by Mussolini, then still a socialist extremist leader who said that ‘the socialist party is antidemocratic because democracy is a bourgeois expedient’ (74). Gramsci’s own brother joined Mussolini and in 1914 Gramsci himself planned to write for Mussolini’s newly founded newspaper. But two years later, Gramsci was solidly Crocean when he published La Città Futura in the form of a magazine, with the pedagogical intent to educate the youth. In the third chapter, ‘A Philosophy of Praxis’, we see Gramsci committed to issues of culture with an orientation towards Antonio Labriola and his humanistic (non-positivistic) and voluntarist Marxism, as well as his gradual involvement with the socialists of Turin. This is when WWI broke out although Davidson’s focus on Gramsci and his comrades leaves no room to say anything about the war. It is scary to see how careless and reckless these socialists and communists were towards the rapidly growing fascist movement. Before that they were concentrated almost completely on their ideological differences and on their relationships with Moscow, underrating fascism and declassifying it to the rank of one tactical tool of bourgeois parties amongst others. However, in the fourth chapter, ‘An International Figure?’, we witness Gramsci, alongside his friend Tasca and fellow citizen Gobetti, start focusing on fascism in a more intelligent and clear manner than most other commentators. For instance and sadly unlike many Italian intellectuals and journalists today, he was able to perceive the strong tie between fascist activists and the Italian masses. He held no idealisation about the masses. Davidson rightly observes that this sensibility came to Gramsci from Crocean morality. Of them Gramsci writes: ‘cruelty and absence of sympathy are two characteristics of Italian people, who pass from childish sentimentality to the most bloody and brutal ferocity, from impassioned anger to cold contemplation of the evil-doing of others’ (207) And as Davidson follows, ‘Gramsci understood why D’Annunzio attracted so many young Italians: the fanatical admiration for the intelligent man as such, which corresponds to the cultural nationalism of Italians, perhaps the only form of popular chauvinism in Italy’ (208). The final chapter, ‘A Revolutionary Theory’, tells us that the decisive point of the split between Gramsci and his comrade Palmiro Togliatti (who later on became for decades the long-time leader of the Italian communist party) was Stalin: the former criticised him while the latter praised him. The main argument Togliatti proposed to Gramsci was that Stalin had the support of the majority of the Comintern. Gramsci replied that this argument was ‘without value’ (258). Although Togliatti threw into the bin this letter from Gramsci, we have it because Gramsci kept a copy, despite the fact that years afterwards, Togliatti denied its very existence. Only two weeks after Togliatti received this letter, in November 1926, Gramsci was arrested by the fascist police and put in prison, where he remained until a few days before his death in 1937. However, in those 11 years in prison he committed himself to intellectual work and wrote his masterpiece, The Prison Notebooks. Davidson observes that the first book he requested while in prison was Croce’s Theory and History of Historiography, ‘deep food for thought’ (262) that Gramsci maintained was the synthesis of the entire Crocean philosophy. In fact, he repeatedly stated that Croceanism was the main contribution of Italian intellectual culture to world culture and that Croce was ‘a man whose theory should not be lost’ (277). How sad it is to note that the anti-Croce instructions launched by Togliatti in the late 1940s have been so effective and that the Crocean legacy had been destroyed, at least in Italy. From Croce Gramsci took the idea that the human mind is not in the individual person but in the ensemble of human relations, the Crocean ‘Spirit’. Gramsci rejected Stalin’s fatalistic theory of the inevitable fall of capitalism and of fascism, which, instead, was embraced by Togliatti. Against the Comintern Gramsci maintained that hunger and misery by themselves cannot cause a revolution; on the contrary, fascism deteriorated the conditions of the proletariat so much that now the frontal assault to the state became much more remote and practically impossible, and the real battle was to regain the ‘bourgeois liberties destroyed by fascism’. Also, Gramsci did not like the abstract internationalism of Trotsky, coming from the cosmopolitanism of the Enlightenment, because the point of departure of any real political development must be ‘national’, an idea he took from Mazzini. In fact, Trotsky’s ‘non-national’ conceptions led to passivity and inertia for two reasons: 1.) ‘through waiting for everyone to move together, nobody moved or organised in the meantime’, and 2.) ‘what is awaited is an anachronistic and anti-national form of “Napoleonism”’ (271). I notice here what are, in my opinion, some general defects of this book: a general lack of dates and a blurry chronological order. For instance, the book is unclear in identifying what precise year Gramsci went to Turin (1911). Davidson assumes that the reader already knows much. Further, despite its title, this biography is not thoroughly intellectual. One example concerns the difference between Marxism á la Bucharin (positivistic) and Marxism á la Croce (idealistic), differences that are not broached. Another is Davidson’s claim that the senses precede thought is an idea which comes from Marx, an epistemology reaching back to the Aristotelian tradition which in Italy in those years was famously revived by Croce. Moreover, Davidson idealises his author excessively and fails to highlight his mistakes, such as his belated awareness of the dangers of fascism. Davidson is right in claiming that this book describes Gramsci as an individual person and not merely as a pawn in the larger design of his historical context. Also, Davidson possesses a balanced approach and is not a fanatic, orthodox Marxist who predominantly commits his pages to slight differences between the many different members of the Third International. Also, writing the book in 1976, Davidson does not adhere to the worship of power characteristic of Stalinist Communist parties which saturated Marxian academia of the 1968 movement. Further, Davidson shows how, summing up, Gramsci eventually was more of a friend to Angelo Tasca than of Bordiga and Togliatti, despite the ideological differences between the two about the Bolsheviks. Here, the importance of Croce and moral sensibility (arguably lacking in Bordiga and Togliatti) were decisive. An overall message impressed by the book is very topical for today, namely how political systems tend more and more to increase its power (even to the point of achieving absolute power) through ‘hegemony’, i.e. through the consent of the masses, rather than through direct state coercion. Finally, from it we can draw admiration for the moral strength of Gramsci himself, capable of keeping his mental sanity in prison through his commitment to intellectual ideals and loyal friendships.